Before my husband’s retirement earlier this year after 31 years in the Air Force, I had the opportunity to travel with him to various bases in order to hear firsthand the concerns of military spouses and family members. Whether during organized meetings with spouses, often in a joint services environment, or a simple get together over coffee, I came to expect the same three issues would be raised by military families as their top concerns. They were nearly always the same: military spouse employment, childcare and education issues for military kids, and the effects of years of deployment and separation on families. 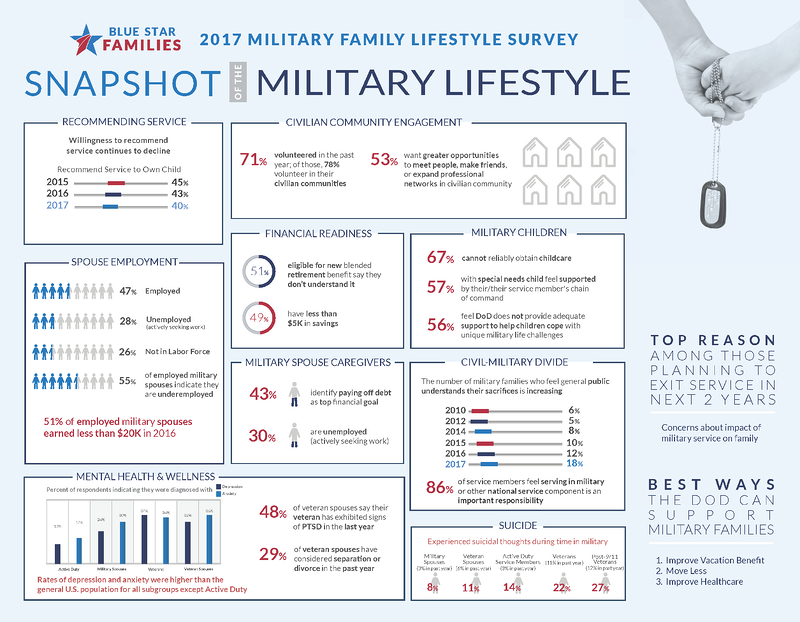 The Blue Star Families Military Family Lifestyle Survey of 2017 only reiterates what I saw ‘on the ground.’ In the largest survey of its kind, the amount of time military members spend away from their families edged out pay and benefits as the top issue for the first time since 2013. Other major concerns which will likely be no surprise to any service member or family include: military child education, spouse employment, pay and benefits, the impact of deployment on children, and military family quality of life. 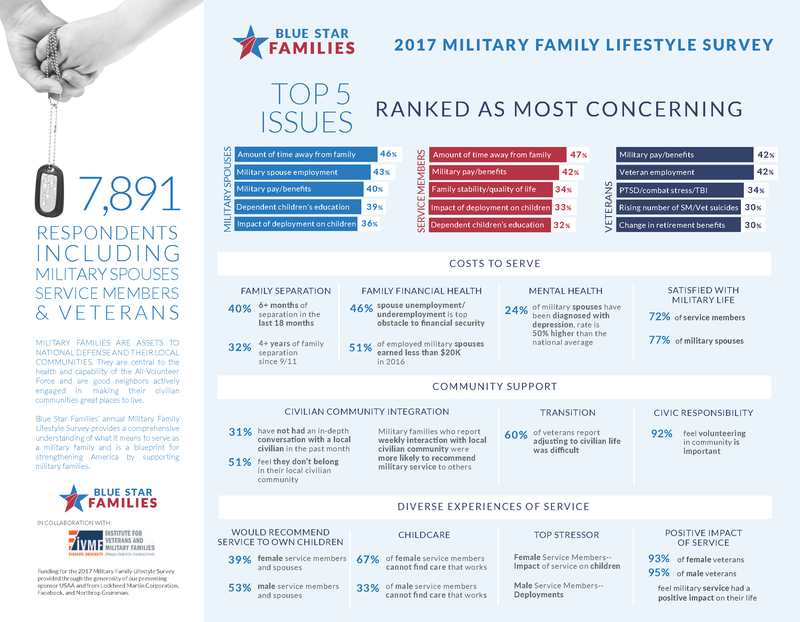 Before we dig further into what the numbers tell us, it’s worth noting that Blue Star Families has conducted this survey for the past 8 years in order to bring knowledge and understanding to communities, leaders, philanthropists, and others concerned with military family quality of life issues. This year’s survey took place earlier this year, with over 7,800 people responding, including active duty, veterans, and immediate family members. It is safe to say that those of us who were associated with the military during 9/11 did not expect that we’d still be at war some 16 years later. With a civilian population seemingly unaffected by the ongoing conflict, the disconnect between military and civilians in certain areas is noticeable. "The majority of military families do not feel they belong in their local civilian communities. 51% of military family respondents indicated that they did not feel a sense of belonging within their local civilian community and 53% felt they were not valued members of the local community. The majority of military families lack adequate time to form local community bonds on their own, as 72% of military family respondents indicated living in their current community for two years or less." On the bright side, the feeling that civilians truly understand the sacrifices of service members and families has steadily increased over the past several years. The majority (51%) of employed military spouses earned less than $20k in 2016. Only 17% of female military spouses stated that their employment or education decisions had not been impacted by challenges faced with finding adequate childcare. 28% of military spouses were unemployed (actively seeking work). Unemployment rates for military spouses increased by 33% from 2016. Increasing military-civilian connections. 78% of respondents volunteered in their local communities over the past year, and over 50% wish to expand their networks and friendships in their community. Service members don’t fit into any mold. Many are single parents, have spouses with their own professional careers and goals, or may have special needs children. While much has been accomplished in regards to providing 24-hour childcare for shift workers, addressing licensing issues for professional spouses, and access to timely, competent care for EFMP families (Exceptional Family Members Program), it is clear there is still much to be done. The high ops tempo of the past 16 years is untenable. “Military families have a strong desire and commitment to serve; however, responses suggest they remain rational actors who are increasingly assessing alternatives to service.” Are you listening, Congress and Mr. President? Military families are tired. There’s so much more to dive into from this survey, from the effects of PTSD to rates of depression among active duty family members. While over 90% of all veterans responding noted the overall positive impact of military service and their pride in serving their country, it’s important to take notice and look for solutions to the unique problems that go hand in hand with the military lifestyle. We’re grateful to Blue Star Families for shining a light on issues which can be uncomfortable to talk about in the military community, much less with civilians, and being a voice for those who serve. For more in-depth information about this year’s survey, visit Blue Star Families.